By Sue Chan - New Zealand - 22 Jun/03 - Viewed 1660 times. Leaving the Christchurch Motel at 8.30 am on a Monday we found the �city driving� not as easy as it was on Sunday afternoon! For a while we thought we were on the wrong road however eventually we came to a sign which indicated we were actually heading west. Like most other place in N.Z. we found there were few road signs until you were almost at your destination, which made it a bit difficult. We were across the city in three quarters of an hour so I suppose that would be about average at that time of the morning so we didn�t do too badly. The Canterbury Plains cover an area of 12,000 square kilometres and produce wheat and sheep. This was quite a different type of drive than the ones we had been accustomed to. We passed through several small towns one of which was called Sheffield. Of course we had to stop but there was nothing at all there. (I was born in Sheffield Tasmania). At Springfield we had smoko. This is one of the stops on the TransAlpine Railway and we saw a train pass through. We later went across to the Railway Station, which was quite large, but although it was open there was not a soul in sight. We thought the staff had probably gone for smoko, as there would be few trains passing this way. The mist on the mountains started to lift soon after we left the plains and we were fortunate that it cleared to a really beautiful day. The highest point on this road is at Porter�s Pass, which is, at 944 metres, a few metres higher than Arthur�s Pass. These were the first mountains we had seen this close and we had to restrain ourselves from taking photos around every corner. At Castle Hill there are rock outcrops of limestone where Maori hunting parties once sheltered and drew pictures inside a cave. In later years a staging post for Cobb and Co. Coaches was built there. A little further on is Lake Lyndon, which freezes over in the winter to become a favourite skating rink for Christchurch residents. At Lake Pearson, where we stopped at the large parking area for a drink, the cloud was still very low. Ten minutes later a mountain appeared out of the mist! We hadn�t realised it was there. A lovely spot, but I don�t know if I would like to live on the farm we could see in the distance. After stopping for yet more photos we reached Arthur�s Pass Township at 12.30pm. The first road - surveyed by Arthur Dobson - was built in the1860s to supply the West Coast gold diggers from Christchurch. At the visitors centre there is one of the old Cobb and Co Coaches used on the service. These covered 270km in 37 hours and passengers were often happy to get off and walk up the steeper grades! After lunch we walked about 1km to Devils Punchbowl Falls, which plunge 131m into a steep valley. In 1923 the Otira tunnel was opened and the Midland Railway completed so the coaches gave way to trains. The steep road, which climbed around the mountains, was often closed by snow and rock slides. In 1999 the Otira Viaduct was opened and in 2000 the last section was completed so hopefully the road from east to west will now be opened all year round. At the lookout we saw several Kea, native parrots known for their habit of stripping rubber fittings from cars and taking anything else they can find. The road from here wound through the mountains with spectacular views before reaching the flatter country on the western side but there was nowhere to stop. We passed Reid Falls and saw wild Lupins and Tiger Lilies. 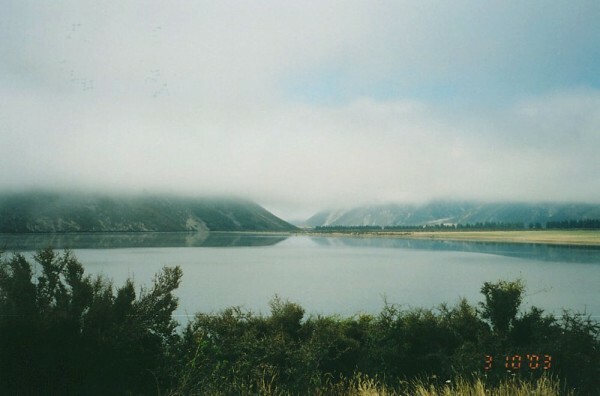 As we were making good time we turned onto a tourist route, which took us into Greymouth via Lake Brunner, the West Coast�s largest lake, instead of the more direct way to the coast. It was a nice drive and the distance was much the same so it was worth the detour. We stopped at Moana the main town, a very pretty place on the shore of the Lake, and arrived at Greymouth, the largest town on the West Coast (pop.10.000) by 3.50pm. Our accommodation for the night was at Rosewood B&B and we had a very nice room with ensuite. There was also a guest lounge with a fridge, tea, coffee and biscuits. With directions we left for a walk along the �Great Wall of Greymouth� a huge rock breakwater built in 1991 after two disastrous floods. As well as protecting the town from flooding the wall directs the force of the river currents against the sand bar at the river mouth and reduces the amount of dredging needed to keep the channel open. We found the start of �The Wall� with the help of two children who told us there was a shorter way into town and thought we were a bit odd wanting to go that far. We began our walk near Lake Karoro, a tidal lake, and continued for some distance before crossing a road and passing Erma Moana Lagoon, also tidal. Soon we came to Fisherman�s Wharf, the anchorage for the local fishing fleet of 40 boats and up to 50 visiting boats in the Tuna season. About 6000 tonnes of fish are landed each year and most are processed at two Greymouth factories. The port serves both cargo vessels and the fishing fleet as well as shipping about 100,000 tonnes per year of coal and gravel to the North Island in barges towed by tugs. Here we left the wall for a time and walked along the road past the Harbour Board Building, built in 1884 and currently being restored by the Grey River Heritage Trust. A bit further on we again followed the wall along the Grey River into town. The Clock Tower was erected in 1992 and the clock from the old Post Office, which had been removed in 1945, was mounted in it. We turned into town as the clock struck seven and as we were standing under it we were almost deafened! Opposite the Clock Tower is the Left Bank Art Gallery, in premises which were built in 1929 for the Bank of New Zealand, and nearby is a mural of the port as it used to be. We visited McDonalds (again) and the Jade Boulder Gallery before following along the main road back to our lodgings. We walked four kilometres in three hours, which was good after a long drive. Forty-five kilometres north of Greymouth is Punakaiki and we had been told it was well worth the detour to see the Pancake Rocks. We set off at 9am with mist still shrouding the hills, and after 40km realised we were on the wrong road. We had not crossed the river and eventually would end up back in Nelson! Well we had been invited back but we thought this was not the time so we retraced our path back to Greymouth. First we drove along the Esplanade where we saw huge bleached logs high up on the beach, evidence of the wild seas experienced here. It took an hour to get us heading up the coast but we eventually found the right road and it definitely was worth it. The coastal scenery was glorious and Pancake Rocks, at Punakaiki, were unusual limestone formations created by wind and waves over millions of years and very interesting. The rocks are viewed from a boardwalk, which follows the coast for some distance. Scientists are at a loss to explain the reason these formations are at only this location. There are quite a few tourist facilities at Punakaiki and we had an early lunch at the caf� � pancakes of course, what else! We passed back through Greymouth at 1.30pm and continued on to Franz Josef Village our next stopover. On the way we crossed two one-way bridges � common in New Zealand. These two also had railway lines on them, which could make it interesting at times!